Manager Craig Hignett (right) with chairman Raj Singh (left). 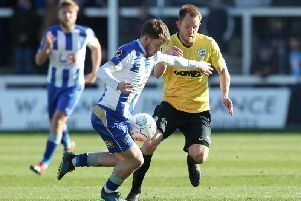 Hartlepool United are facing a contract crisis at the end of the current National League season. But manager Craig Hignett remains calm about the prospect of hanging on to his better players. A number of Pools' first-team players find their deals coming to an end at the end of 2018/19. Among those out-of-contract in June are ever-present keeper Scott Loach, top-scorer Liam Noble, current skipper Ryan Donaldson and club captain Carl Magnay. As well as that key quartet the loan trio of Luke Molyneux, Nicke Kabamba and Michael Raynes will all see their temporary deals end, but all three could be made permanent, depending on their performances between now and May. Hignett admits the size of the task ahead, but he's also relaxed about the prospect of assembling a squad for next season - with the manager happy to leave the majority of decisions on players' futures until this season is over and done with. "Everyone is playing for their contracts," said Hignett. "My main focus is on now. I have one eye on that situation but we must deal with the task we have now to the end of the season. "We have to see where we are then. We do have a lot out of contract in the summer - they might want to look elsewhere, we might want them to look elsewhere. "I will deal with that in the summer when we have this season wrapped up and where I want it." Loach and Noble are understood to be keen to remain at Pools with the former going on record stating his desire to stay at the Super 6 Stadium. Speaking to the Mail earlier this month, he said: "There’s been nothing (discussions over a new deal). “To be fair, the gaffer has come in and I’ve got to prove myself all over again. “It doesn’t matter what I’ve done in my past or here, you’re playing for a new gaffer and you have to impress him - as do the rest of the team. “We all know what I think about the club and how I feel about the club, but we know how football works. "Every one of us in that team now has to prove to the gaffer that we’re worth keeping on. And that’s what we’ve got to do now. "We’re playing for our future because it’s a job. "I’m not daft enough to forget how football works. It doesn’t matter where you’ve been or what you’ve done, it’s the here and now. "We’ve all got to sharpen up quickly and if we can get a few wins under our belt and get to a position where we’re not going to go down, then we can start working on things for next season and have a go." Noble's contractual situation is being monitored by a number of Football League clubs.